Two leading advocates for the arts and humanities in Maryland have elected Scott Casper, dean of UMBC’s College of Arts, Humanities, and Social Sciences, to their boards of directors. 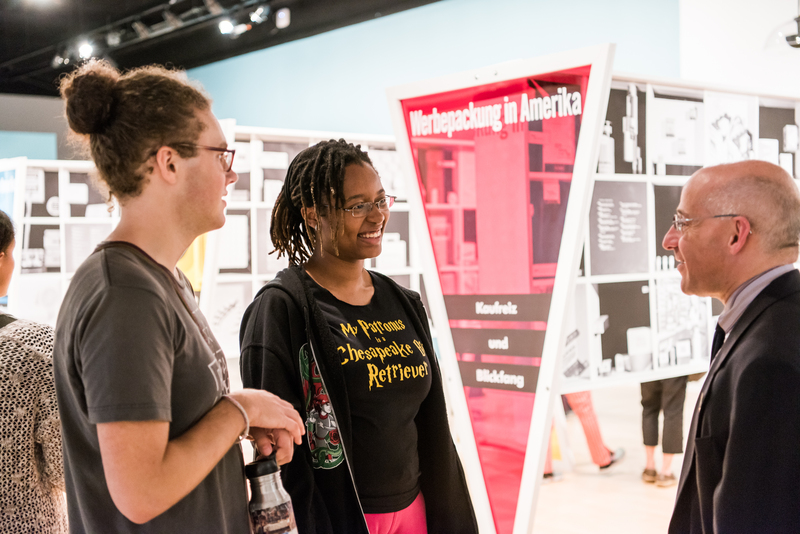 Casper is now beginning three-year terms with Maryland Humanities and the Greater Baltimore Cultural Alliance (GBCA), continuing UMBC’s strong tradition of partnership with the two organizations. Maryland Humanities has long been a champion for UMBC’s humanities scholarship. Numerous UMBC faculty have received Maryland Humanities grants over the years. Most recently Felipe Filomeno, assistant professor of political science, and Tania Lizarazo, assistant professor of modern languages, linguistics, and intercultural communication, received support for their project “Honest Conversation: Faith Community Dialogues on Immigration and Race.” Additionally, Maryland Humanities has worked closely with the Dresher Center for the Humanities at UMBC to highlight humanities scholarship through the regular audio segment Humanities Connection, aired on WYPR. 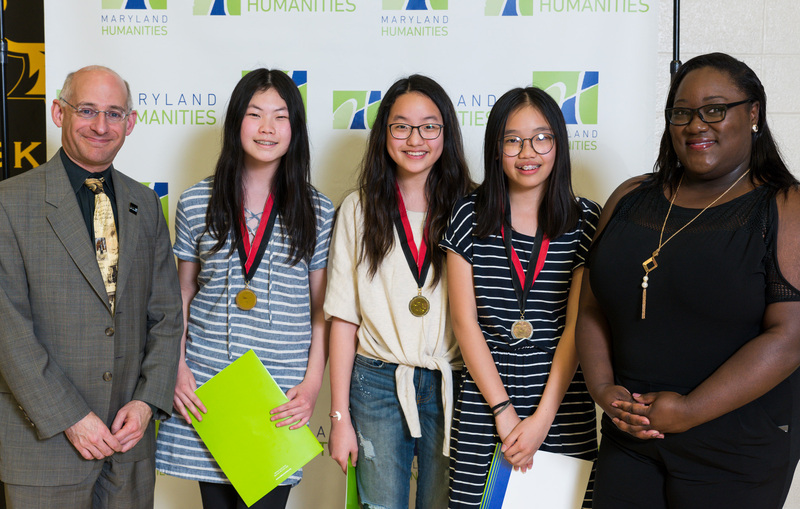 (L to R) Scott Casper with Angelica Frude, Lydia Yeh, and Paris Ye from Eastern Middle School, who won first place in a Junior Group Website in the Maryland History Day competition 2018, and Mishelle Johnson, from the office of Senator Van Hollen. Courtesy of Mitro Hood ’89, photography. Both institutions have also partnered for the annual Maryland History Day, which is sponsored by Maryland Humanities and hosted at UMBC (this year on May 11). This program engages 27,000 middle and high school students across the state in historical research projects each year, to help them develop skills in research, critical thinking, writing, and public speaking. In the spring of 2018, when Maryland Humanities celebrated its 45th anniversary, the organization also honored UMBC President Freeman Hrabowski for his dedication to the organization and his service as a former board member. Casper with students at an exhibit by Peggy Re, associate professor of graphic design, in UMBC’s CADVC. The GBCA has partnered with and supported UMBC’s arts community throughout its seventeen years as a vital arts organization for Baltimore artists. Several UMBC arts faculty have received GBCA awards to support their work, including Tim Nohe, professor of visual arts and director of the Center for Innovation, Research, and Creativity in the Arts (CIRCA); Lee Boot, director of the Imaging Research Center; and Kathy O’Dell, associate professor visual arts and special assistant to the dean for education and arts partnerships. Numerous UMBC faculty, staff, and alumni have received GBCA Baker Artist Awards. Most recently, celebrated jazz pianist and composer Lafayette Gilchrist ‘92, Africana studies, received a Baker Artist Award to help him continue to compose, perform, and record as a soloist and leader of two genre-defying bands. UMBC faculty have also supported the GBCA through service and professional development work, honoring the institutions’ shared commitment to innovation and leadership in the arts. O’Dell served for many years on the GBCA Board of Directors, and continues to serve as co-chair of its Equity and Inclusion committee. Additionally, UMBC’s CIRCA partnered with GBCA in professional development intensives for faculty and students. Banner image: Scott Casper with colleagues. By Marlayna Demond ’11 for UMBC.